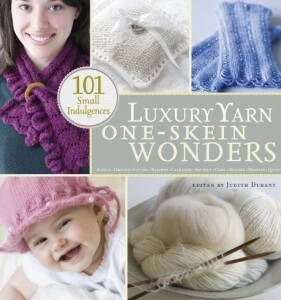 We just received a new shipment of books including the ever-popular 101 Designer One-Skein Wonders, One-Skein Wonders and Luxury Yarn One-Skein Wonders series by Judith Durant. It’s amazing what she can conjure up with only one skein of yarn! She provides patterns that allow you to create projects utilizing yarns from your stash, or create keepsakes using only one skein of luxury yarn. Tilli Tomas comes to mind. . . . The adorable Knitted Odd-Bod Bunch by Donna Wilson contains 35 patterns that are incredibly unique. There is not one pattern in this book that you won’t want to knit! Favourites include: Beryl the Dog; Bunny Blue rabbit; and Charlie the Monkey. These projects make excellent gifts for children and adults alike. 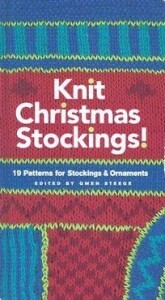 And, for those of you who want to get a head start on Christmas gifts, Knit Xmas Stockings by Gwen Steege contains 19 easy stocking patterns as well as knit and felt Christmas ornaments. But, back to Halloween, this week’s special is Rozetti Coccoon in red and purple. Originally $14.95, this yarn is on special for 40% off and at $8.97 would be perfect for making a dramatic boa or other creative statement. This entry was posted on Wednesday, October 7th, 2009 at 10:49 pm	and is filed under Uncategorized. You can follow any responses to this entry through the RSS 2.0 feed. Both comments and pings are currently closed.